Hegg Hospitality Management, LLC today announced that it has been selected to manage The Kindler Hotel, a 38-room luxury hotel in downtown Lincoln, the first of its kind in the city. The hotel will be part of a major renovation of two buildings at 11th and “P” streets. The development project is expected to cost $10 million. The high-end, seven-story hotel will open in the 2016 N. 11th Street building and is expected to raise the bar for Lincoln’s hotel scene by incorporating touches of history and art in the design. Nicolas and Brooke Castaneda are the hotel developers and owners. 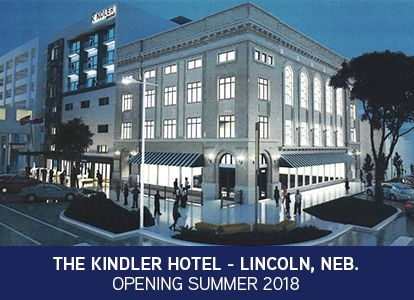 ‘Kindler’ is the last name of Brooke’s late father, who was also an industrial artist in Lincoln, and his copper and metal artwork will be incorporated throughout the hotel design. In addition, many of the historical exterior features of the adjacent four-story Commercial Club building on the corner will be restored, including the second-floor windows and the dramatic 25-foot ceilings in the third-floor banquet space. The two buildings will tie together with new elevators and infrastructure, and a skywalk across the alley will connect the new hotel to the Que Place Parking Garage. The Kindler will also offer guests a unique, more personal experience, including high thread count sheets, robes and slippers, custom designed rooms, in-room minibars, elegant drapery, rain showers, access to the spa, and more. A hotel reception area and indoor/outdoor lounge, wine bar and wine cellar are planned for the ground-level, in addition to Misty’s Restaurant, which will continue to operate on the first floor. Commercial space is planned for the second floor, with the fourth floor designed for residential and hotel space. A fifth floor could be added to the Commercial Club building in the future if residential and/or hotel demand makes it feasible. Cas-Neb-neda, LLC, whose principals include Nicolas and Brooke Castaneda, will be the owner and developer of the hotel. Construction is set to begin in May 2017 with the open date in summer 2018. For more information, please contact Ronette Hegg.